Gas meter box doors and Electric meter box doors might need replacing due to general wear and tear or vandalism. It is also possible for a door to get damaged if it gets caught by the wind. Solutions are available to repair damaged meter boxes, such as spare doors, hinges and over boxes. These repairs are relatively simple to carry out and do not require the disconnection of the meter. Prior to replacing a broken or damaged meter box door, you should measure the existing door or door profile to ensure that you select the correct replacement door. Measure the height (top to bottom) of the door, for example in the image below the height of the door is 550mm. Measure the width of the door (left to right), for example in the door shown in the image below the width of the door is 384mm. Measure the width of hinges, for example, the width of the hinge in the image shown below is 25mm. Measure the distance of hinges from the top and from the bottom, for example in the image shown below the hinge are 56mm from top of door and 59mm from bottom of the door. Look at the type of hinges on the door (if available) and make a note if they are located on the right or left-hand side (while looking at the door from the outside). For example, in the image below the hinges of the door are located on left-hand side and the door opens from right to left. 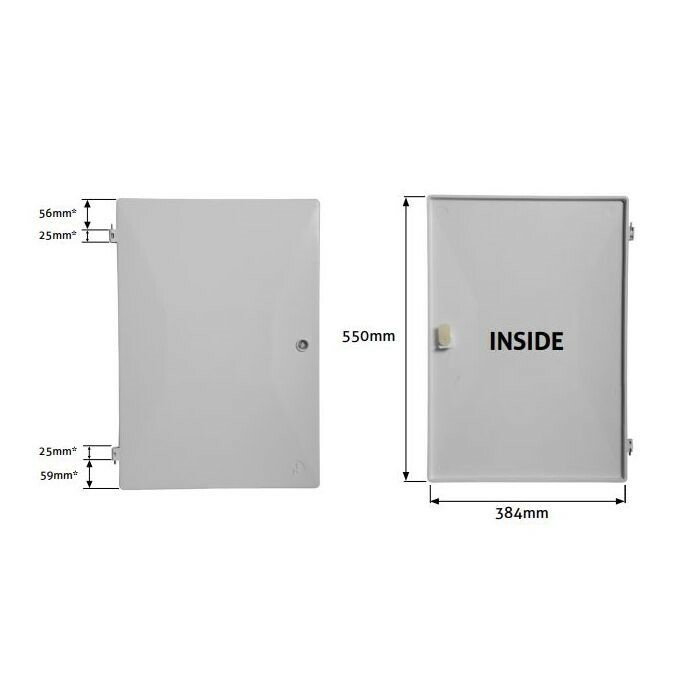 Do note that some replacement meter box doors are suitable for both recessed and surface mounted meter boxes, e.g. Tricel's UK standard electricity meter door. Most doors are supplied along with hinges, lock and key. Do check with the supplier prior to the purchase. Selection of spare parts for meter box such as door lock kit (Aluminium or Nylon), latches and stainless steel and brass pin hinge kit are also widely available. If your meter box door is missing, you can measure the meter box door groove on the frame by following the same five steps mentioned above. Once the correct electricity or gas meter box door has been identified, all that is left to do is to fit the replacement door in place. Remove the damaged meter box door by depressing the brass pin (or spring pin hinge) from the top hinge of the door. You can do this using a flat screwdriver. If the hinge is stuck inside the hole, the brass hinge can also be trimmed using a Junior-Hacksaw. Be careful not to damage the housing when cutting the brass pin. Once the brass pin has been removed, the door can be pulled out from bottom hinge easily. Do not cut the bottom hinge as it is made of steel. Hold the replacement door upright. First place the steel pin hinge into the pre-drilled hole at the bottom of the box. Position the brass spring hinge pin near the pre-drilled hole at the top of the box by holding it depressed with a flat screwdriver. Take screwdriver off when the brass hinge pin is near the hole. Push the door slightly inside the housing and the spring brass pin will expand into the predrilled hole. Close and lock the door to check the fit. If you have any questions or require any help in choosing the correct meter box door, please, contact us.